Quantity discounts allow store administrators to grant customers discounts for buying in bulk. These discounts are taken off before customer level discounts and coupons are deducted. On the main quantity discount page, store admins can select an existing discount from the list to view/edit it, or click 'Add New' to create a new discount table. The number of initial values is how many rows your table will start with. If your discount is for any purchase over 10, for example, you only need one row. If you have one discount amount for 5-10 products, another for 11-20, etc, you will need multiple rows. Discount type can be either percentage, or a flat dollar (or other currency) off. Note that this is a per-item discount. Once those fields are complete, click 'Add Discount Table' and you will see the screen below. Fill in the rows in the table and click 'Insert Initial Values'. NOTE: Be sure that your table covers all of the possible quantities you want customers to get discounts for. The table above would not grant a discount to a customer purchasing 16 of a product, as the value 16 is not covered in the table. 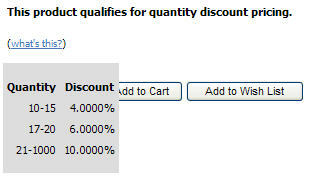 To edit an existing table, click its name from the list at the upper left of the quantity discounts page. A screen like the one below will appear. Store admins can edit existing rows, add rows with the 'Insert NEW Values' button, or delete existing rows. Quantity discounts display on product detail pages on the site's front-end. These discounts will appear one of two ways, depending on the ShowQuantityDiscountTablesInline AppConfig. Also note that the QuantityDiscount.PercentDecimalPlaces AppConfig (9.2.0.0+) can be used to set how many decimal places to display in your quantity discount tables, when using percent-type discounts. Quantity discounts are calculated per product, not for an entire order. If a discount requires a minimum purchase of 10, customers must purchase 10+ of each product to get the discount, they cannot combine multiple products to reach that minimum. true - All line items of a specific product will be combined when determining whether an order qualifies for a quantity discount. For example, if product 14 comes in red, green, and blue, all instances of product 14 will be counted towards the quantity discount, regardless of color chosen. false - Each line item of a specific product will be considered individually when determining whether an order qualifies for quantity discounts. For example, if product 14 comes in red, green, and blue and a customer orders some green and some blue, the quantity of the blue items will be checked to see if it qualifies for a quantity discount, and then green will be checked separately. Quantity discounts can be assigned to individual products, or entire entities. If assigned to an entity, all products mapped to that entity will get the quantity discount.